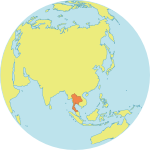 KRABI, Thailand – The young parliamentarians who gathered here recently at an international conference on sexual and reproductive health rights agreed to strengthen their work on these issues when they returned home. “As parliamentarians, you play a crucial role in bridging the gap between the people and the government,” said Safiye Ça?ar, UNFPA’s Director of Information and External Relations, who opened the Nov. 15-16 meeting for Members of Parliament (MPs) under 35. Ms. Çagar emphasized the importance of their work since the International Conference on Population and Development (ICPD) in Cairo in 1994, where 179 countries recognized sexual and reproductive health as a human right. 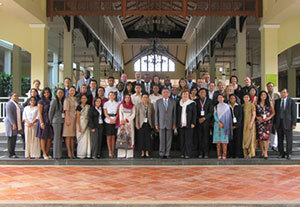 Young parliamentarians meeting in Thailand, focused on sexual and reproductive health rights. “Since that time, national parliaments have reordered population and development policy priorities and passed laws at national and subnational levels to protect, uphold and promote reproductive rights, gender equality, youth-friendly information, counselling and reproductive health care,” Ms. Ça?ar said. People 15 to 24 years old make up about 43 per cent of the world’s population, yet they face limited resources and confront such major challenges as getting an education, finding jobs and securing access to health care. Yet their energy and vision are essential for a vibrant society, and young MPs have an extraordinary ability through their legislature to mobilize these young people to create transformational change. The meeting, which was organized by UNFPA and the Asian Forum of Parliamentarians on Population and Development (AFPPD), was designed to deepen young MPs’ understanding and commitment to the 1994 Cairo conference and to bring them together to exchange perspectives and experiences from their own countries. The 30 who attended showed passion and enthusiasm for their work as well as for sexual and reproductive health issues. They agreed that their young age was a clear advantage in their political roles and that workshops like these were important for what they do. Hon. 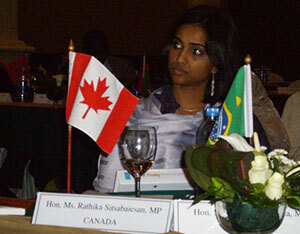 Ms. Rathika Sitsabaiesan, an MP from Canada. The MPs confirmed that more young people are needed in politics and that not enough women are represented on parliamentary benches. The meeting ended with commitments to take rapid action on such matters as promoting reproductive health issues in the media to advocating for better policies and greater resources from their governments. The meeting also helped gear up the MPs for the IPCI/IPCD conference in May 2012 in Istanbul. This annual report summarizes the 2013 programmes, objectives and initiatives achieved, both globally and regionally, in 2013. "Life or death is a political decision."